One of the theories behind the source of the name Yucatán is that is derives from the Aztec word Yokatlān or "place of richness." The Yucatán Peninsula is a beautiful spot for traveling along the southeastern part of Mexico, in what separates the Caribbean Sea from the Gulf of Mexico. Known for it's wonderful Mayan ruins, it's a fascinating journey to the past and, in many cases, accompanied by beautiful climate, food and local shopping. Loltun has some of the oldest evidence of human habitation in the Yucatan boasting 10,000 year old cave art. Merida is a beautiful colonial city that feels like a small town, but has much more to offer. 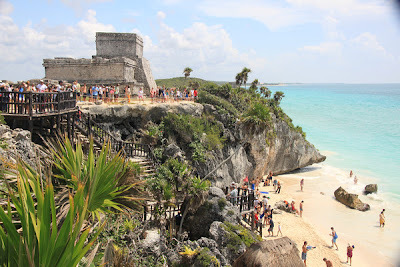 Host to Mayan ruins in a beautiful setting on the coast south of Playa del Carmen. Uxmal is not quite as grand as Chichan Itza but is less crowded and is interesting in it’s own right. Coba is a 45 minute drive from Tulum and is a much larger site than Tulum. Playa is an hour or so south of Cancun and is a popular destination for Mexicans and Europeans. You can see what else is going on in these towns here.